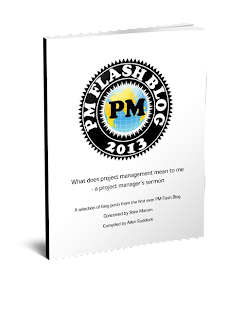 Musings on project management: About mistakes... oops! Some say that an enlightened business/agency/enterprise is one that provides the freedom to make mistakes. Quantmleap had a posting on this very topic. If you're working your own money, then you're free to make mistakes. But, if you're working with other people's money (OPM) it's all together a different situation. This idea about mistakes should be more narrowly drawn, to wit: we need the latitude to take risks --some of which may not work out -- that are within the risk tolerance of the enterprise. How do we know what the tolerance limits are? We can ask, or by experience and intuition we learn/know the boundaries. Here's the tricky part: risk attitude is not stationary: it matters when you look at it. Over time, optimism abates; pessimism rises. And, prospect theory tells us that risk attitude is different if you are facing a choice between bad or worse or between good or better. We also need the latitude to make tactical errors (mistakes in some cases or calculated risks in others) so long as we don't make a strategic error. That is, we can be wrong tactically so long as we can recover and get back on a track toward the strategic objective. But to make a mistake on the strategic objective is almost always fatal. We should also be mindful that -- even with the latitude allowed for these classes of mistakes or errors in assessment or even judgment or risks gone bad -- the cause or causality of the mistake is material. Negligence will never be tolerated; so also duplicity, though innocent ignorance may be ok. Thus, the same mistake (effect) with different cause may be tolerable, or even thought to be a good bet that didn't work out. Consequently, as in all 'rights', the right to make a mistake is not absolute; as a practical matter there are often many constraints to even a liberal degree of latitude. What time is the 3 o'clock meeting?